Did you know that most plate amps have built in EQ settings that make it difficult to achieve accurate bass? Most have a fixed EQ boost. 6 dB @ 30 Hz is common. To remove this boost means a modification that will void the warranty. We take a different approach. All our products feature the kind of EQ that audiophiles desire. On this page we show the superior EQ featured in our products feature. They allow you to control driver excursion, increase dynamics and output, integrate with room gain correctly, and achieve the response you want. The above figure shows its max output in a non servo, no-equalized, configuration under 350W input. The internal volume is 54 liters internal volume (Note our recommended box size is 2 cu ft or less). Note the F3 point is at 42 Hz. However, since the amp power is high at 350W, the output at 20 Hz is still usable at 101.2 dB with an excursion of 14mm. If we assume a room gain of 6 dB , then the in-room response will be 107.2 dB. That is comparable to a in-room 110 dB system with -3 dB(107 dB) at 20 Hz. The F3 of 42 Hz is under the condition that the amp out does not have any equalization or pre-emphasis. Using the same driver and enclosure, but in the Direct Servo configuration, the system performs equalization via the closed servo loop. In the above discussion we explained how the adaptive frequency equalization works. Again we need to emphasize that the equalization is transparent to users. Next we will explain the extension filter. Its purpose in the sealed box configuration is to set up the extension characteristics, specifically roll-off corner frequency and the damping factor. The rationale is simple. We start with a relatively flat response. Then we use this 2nd order high pass filter to accurately control the roll-off characteristic, instead of letting the box size and the amount of stuffing to determine the roll-off. 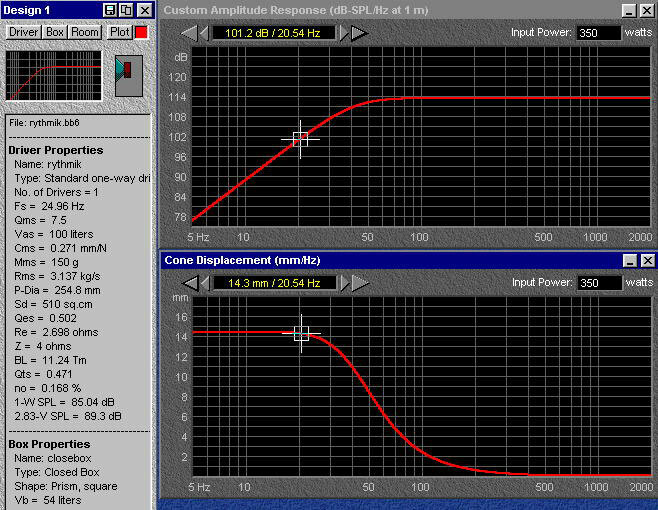 Without the extension filter, the frequency response would have been -3 dB @ 10 Hz as shown on the right. The phase shift at 20 Hz is only 45 degree. The extra phase shift below 20 Hz is due to microphone (you wouldn't think microphones have flat to DC response). The 2nd order extension filter has 3 frequency settings: 14 Hz, 20 Hz and 28 Hz. The damping factor control has high(Q=0.5), med (Q=0.7), and low (Q=1.1). Both controls are located on the plate amp. The following chart shows the response of one of our Direct Servo subwoofers without bass filtering. The following three figures show the actual frequency response for all 3 damping settings when the frequency is set to 14 Hz, 20 Hz, and 28 Hz. The low damping setting provides a boost up to 1.5 dB whereas high damping provides a most smooth and gradual roll-off. They give a total of 9 different roll-off characteristics.